Many sales organizations focus their training efforts on their sales force and management team while essentially ignore their other employees out of the training and development loop. But many of these employees are on the front lines of engagement with your clients. People’s interaction with your employees often forms that critical first impression of your organization. This is why it is extremely important to train all members of your team about the products and services you offer, as well as the organization’s mission, vision and culture. Knowledgeable employees who can discuss your business offerings confidently and effectively will enhance every aspect of your business. Employees who know the ins and outs of your portfolio of products and services, as well as the reasoning and purpose behind them, can do a better job for the organization while providing themselves with a sense of accomplishment and purpose. Training your employees leads to better retention because these important members of your sales team will see that you value them enough to educate them. That will help them advance in their careers. A current administrative assistant could someday become the next top producer, wholesaler or department head. FSSEdNet’s video-based training curriculum can be accessed at any time, from anywhere, on any device, via our mobile apps. The FSSEdNet sessions are designed to help all levels of employees and staff quickly, easily and effectively develop the necessary skills, knowledge and insights on the purpose of and details about the products and services they work with as they serve your organization’s clients, whether they are individuals, families or businesses. This training will enhance your employees’ understanding of the needs, wants and desires of various types of clientele. It’s a cost-effective, time-efficient way to increase employee productivity, retention and service and support effectiveness, resulting in better clientele satisfaction and retention. It provides employees at all levels of experience with knowledge and insights while clarifying the meaningful purpose of their roles, leading to improved attitudes and future opportunities for your employees. It provides the pathway for career development and growth, which can turn their potential into reality. And because time is always a factor, your team members can access FSSEdNet anywhere, anytime on any device. Our training is a perfect solution for today’s on-the-go lifestyle that so many of today’s team members have. It develops not only a general understanding of the products and services the financial services industry provides to individuals, families, and businesses; it also educates staff members on how to promote your organization’s offerings in a way that addresses the needs, wants and desires of today’s consumers. It offers additional training in the areas of Investments (Investing Fundamentals, Products, Concepts and Strategies) and Advanced Markets (Estate Tax Planning, Retirement Planning and Business Insurance) and much more. It is a step-by-step educational curriculum with an efficient resource search feature that will quickly build confidence through competence. SIt satisfies Millennials’ strong desire for development, which is probably the greatest differentiator between them and all other generations in today’s workplace. The online, on-demand, video-based training was designed specifically for the financial services industry, and the curriculum provides access to hundreds of sessions averaging 8 ½ minutes each, all with downloadable worksheets and participant guides. 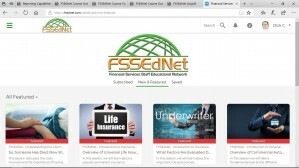 FSSEdNet is designed to supplement your existing training programs, either as self-study or facilitator-led training.